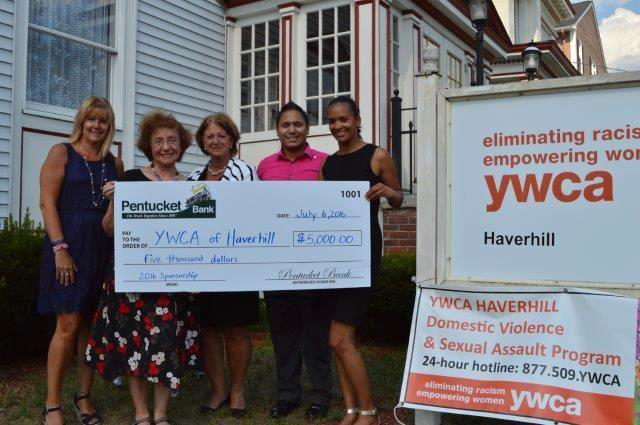 Pentucket Bank presented a check for $5,000 to the YWCA Haverhill on July 6. Pentucket Bank will be the premier sponsor of the YWCA Haverhill’s 27th Annual Tribute to Women, set for October 27 at DiBurro’s. Pentucket Bank presented a check on July 6 to the YWCA Haverhill to kick off its major annual fundraising event, the annual Tribute to Women, to take place October 27, at DiBurro’s. (L to R) Renee McGuire, YWCA Site Director; Mary B. O’Brien, YWCA Executive Director; Patricia O’Brien, YWCA Board President; Jose Pino, Marketing and Special Events Coordinator, Pentucket Bank; Katherine Castro, YWCA Board Vice President. Merrimack St, and most recently, in 2015, Patti Guerin, AVP/Senior Branch Manager at Westgate, amongst others throughout the years. Proceeds from the event support the YWCA Haverhill’s programs, which include year-round child care for working parents, a range of services for victims of domestic violence or sexual assault, and the YWCA Residence, which will re-open this fall after being closed since 2012. “Two very exciting things are in store for the YWCA in October,” said YWCA Executive Director Mary B. O’Brien. “When the YWCA Residence re-opens, it will once again provide much-needed housing for very low income women in Haverhill, and the Tribute to Women is always the highlight of the year for the YWCA,” she added. Proceeds from the event will help to complete and furnish the Residence on the second and third floors of the YWCA building at 107 Winter Street. For the first time, the Residence will be handicapped accessible. Ten single-room-occupancy units will replace what were previously six units. Work began last December and the project is expected to be finished in October. The YWCA and Pentucket Bank two share a milestone birthday this year; both were founded in 1891, and coincidentally, Pentucket Bank’s tag line is “On track together Since 1891.” Information about attending or supporting the YWCA Haverhill Tribute to Women is available by contacting YWCA Site Director Renee McGuire at 978 374-6121 or rmcguire@ywcahaverhill.org. Nominations for women to be honored at the event are being accepted until August 3.